Sen. Steve Henson and I would like you to join us on Monday, February 28th at the Tucker Recreation Center at 7 PM. As you know, we're in the middle of the legislative session and we want to hear your views on the many difficult issues facing Georgia. These include the severe budget deficit, serious traffic problems, insufficient money to continue funding the HOPE scholarship and preschool programs at their current levels, Sunday alcohol sales, and immigration reform. To help us prepare, we invite you to email questions in advance to ann@repscottholcomb.com. At the meeting we will also have representatives of DeKalb County government to address local concerns. One of the greatest challenges Georgia legislators face this session is finding a way to sustain the lottery funded pre-kindergarten and HOPE Scholarship programs. The overwhelming success of these programs makes this problem particularly troubling. Since its creation in 1993, the HOPE Scholarship has helped send 1.4 million Georgia high school students to college. Clearly the continuation of these lottery funded programs is vital for the future prosperity of this state. However, lottery proceeds have reached a plateau while the demand for these programs continues to rise. As a result, over the past several years Georgia's pre-K and HOPE programs have paid out more than the lottery has brought in. If this continues, all reserve funds for these programs will be depleted by fiscal year 2013. To ensure this does not happen, reforms to these programs are carefully being considered during the current legislative session. I am carefully studying the issue and welcome your ideas on how to save HOPE. Governor Deal is expected to present his plans for HOPE on Tuesday, February 22, 2011. I will publish my reaction to his plans in my next newsletter. There are two budget acts under consideration in the General Assembly: the Supplemental Budget for Fiscal Year 2011 and the General Appropriations Budget for Fiscal Year 2012. FY11, a mid-year adjustment to the current budget, is being amended to accommodate a $27 million revenue estimated reduction. The reduction is based principally on federal funds originally budgeted for this fiscal year but used last year to balance the state budget. 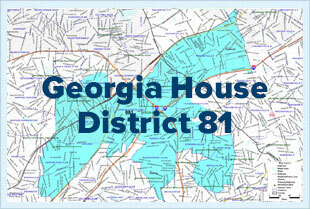 The Amended FY11 budget passed the Georgia House of Representatives. I voted against it in protest to the cuts in education. FY12 has a modest increase in revenue projections of 8 percent; however, without federal stimulus funds available this fiscal year, a projected shortfall of approximately $1.3 billion must be filled. The House will continue committee work on FY12. •	Re-craft the proposed personal income tax credit into a robust, refundable low income tax credit and targeted standard deduction. Download GBPI's analysis with additional adjustment options here. HB 111 and HB 134 - Water Transfers: Legislation that would regulate the transfer of water from one river basin in Georgia to another has been introduced in the House of Representatives. HB 111 and HB 134 are similar proposals that would require the director of the state Environmental Protection Division (EPD) to consider the various economic and environmental impacts on both ends of an inter-basin transfer before deciding whether to issue a permit for surface water withdrawals. New rules for inter-basin transfers recently adopted by the State Board of Natural Resources do not include such a requirement; rather, only a statement that the EPD director "should" consider those factors. Supporters of the new legislation say it would put into law the same wording that is already included in Georgia's water management plan. Metro Atlanta business groups have promoted inter-basin transfers as a strategy to address water shortages in the region due to population growth and a federal court decision restricting Georgia's rights to withhold water from the Chattahoochee River. Status: referred to the House Natural Resources & Environment Committee for its consideration. Background: In Georgia, the state is divided into five regions for the purposes of the PSC commissioner elections. While all these commissioners come from different districts, they are elected in statewide partisan elections. Rationale: Local control of each of the electors is diminished by the five-region election process. Background: Georgia ranks 7th in the nation for home foreclosures. The Protecting Georgia Homeowner's Act of 2011 helps to level the playing field between banks/lenders and borrowers and brings Georgia in line with other states that have added some consumer protections into law. Georgia has no "right to cure," meaning the mortgagee needs the bank's permission to resolve a delinquency - even if a payment is only one day late. Many homeowners do not realize they can lose their home if the mortgage payment is received one day late. Georgia has a non-judicial foreclosure process, which means that the lender doesn't have to take you to court to evict you from your home. Most other states require lenders to sue the homeowner in court to prove a deficiency before a home eviction can occur. This bill allows school systems to notify parents and legal guardians of unexcused absences by first class mail, rather than certified mail. Action: The bill was adopted 153 -15. I voted in favor of this. This bill would allow a spouse or dependent of a deceased public employee the right to continue their health coverage under the State health insurance plan. Action: The bill was adopted: 163 -0. I voted for this measure in the Public Safety and Homeland Security Committee and also during the House vote. This bill would restrict the written portion of the driver's test by prohibiting permanent residents and U.S. citizens from taking the test in any language other than English. Temporary visitors and illiterate persons would still be permitted to take the test in one of fourteen available languages or have it presented orally. The bill was amended and then tabled by a vote of 115 - 50. I did not support HB 72 and spoke against it on during the floor debate. I opposed HB 72 because for many reasons but particularly because: there was no evidence to support the suggestion that this measure would further public safety; and there was no evidence that this measure would result in any cost savings to the State since the test would still be offered in 14 different languages to temporary visitors. In short, I believe that our current law works and should not be changed. Shortens the early voting period from 45 days to 21 days for all elections. The bill would also require polls to be open at least one Saturday during the voting period. Counties would have to pay for poll workers and buildings during the days of early voting. The authors contend that shortened number of days would save costs, particularly for small counties. Critics of the legislation are concerned that the shortened time period will decrease access to the polls for voters. Licensed Practical Nurses would be required to obtain a criminal background check before obtaining a license. A person convicted of a the most serious violent felonies would be required to have that information indicated on his/her driver's license for the length of the sentence, probation and/or parole.